The creation of an incidental peritoneotomy may occur during initial access to the retroperitoneum or during overzealous balloon dilation. Prevention of a peritoneotomy is achieved by careful finger dissection, avoiding overinflation of the dissection balloon, and identification of retroperitoneal landmarks. Another potential complication in this category is subcutaneous emphysema and complications related to extension of CO2 gas through the tissues. On occasions, the CO2 gas can tract extensively into the tissues, resulting in potential pneumomediastinum, pneumothorax, or extension of the gas into the tissue around the upper airway. 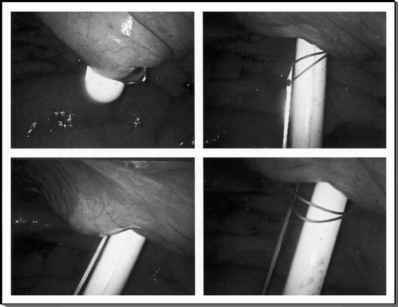 The most efficacious way to prevent extension of CO2 gas through the tissues is to limit CO2 gas insufflation to 12-15 mm Hg pressure, and with the use of a primary camera port with a mechanism to create an airright seal between the retroperitoneum and the patient's external skin such as the blunt-tip port with its internal fascial balloon (Fig. 6). Another mechanism that could result in a pneumothorax is during placement of the posterior port below the 12th rib. If the port is placed too close to the rib, the lower reflection of the pleura could be punctured by the port.